Graduation ceremonies are traditionally sprinkled throughout May and June, so in preparation we’ve revamped our collection of graduation eCards to include a bounty of new material. We’ve packed each congratulation with smart humor for that smart grad, including a new song, some funny remixes and some great new castable art. By the way, you can get the castable pictures printed on cards and mugs in time for those graduation parties this summer. 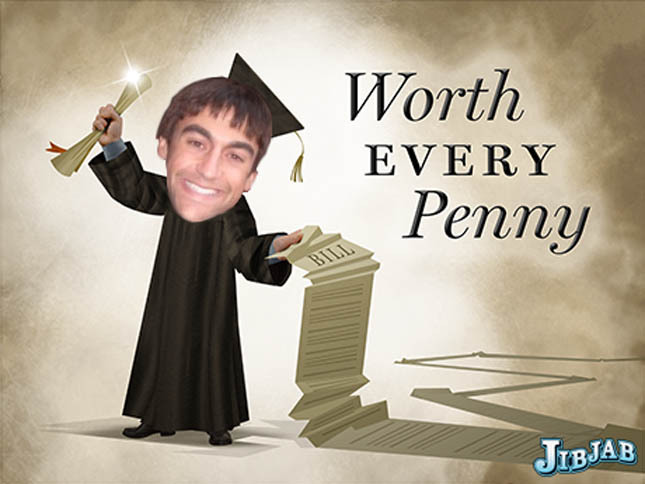 Here’s a JibJab staffer’s soon-to-be graduated brother, with the two big pieces of paper every graduate receives. Click and make your own! This entry was written by paulhanges and posted on May 13, 2009 at 4:39 pm and filed under New Content with tags congratulations, diploma, ecards, grad, graduate, graduation, jib jab, jibjab. Bookmark the permalink. Follow any comments here with the RSS feed for this post. Trackbacks are closed, but you can post a comment. I really like the idea of your e-cards. It fits so well with the current generation. Where writing a card would be like homework.